I'm expecting to create some opportunity for adventure with this project, and since snapper is available right off the shores here, I considered going out and catching it myself. 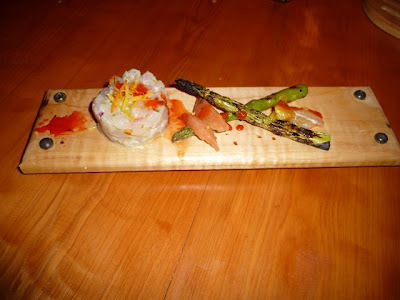 But then I saw all the citrus that was in this dish, and decided I would make this post about the acquisition of it. Which, for the most part, didn't involve putting on shoes. 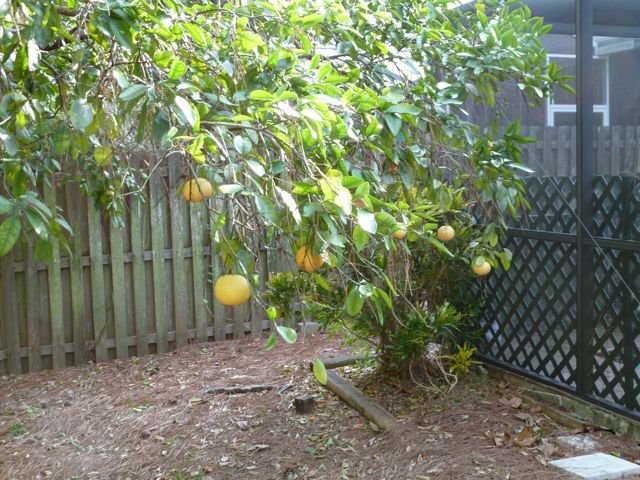 Here is a picture of a grapefruit tree. There are grapefruit in this dish. 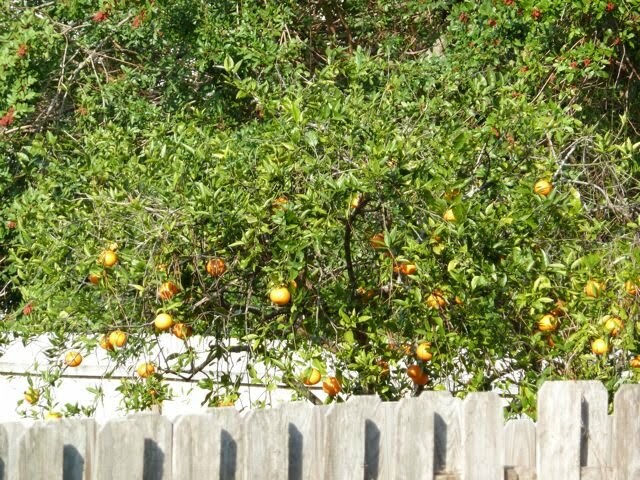 There is a grapefruit tree in my backyard, about 30 feet from my kitchen. 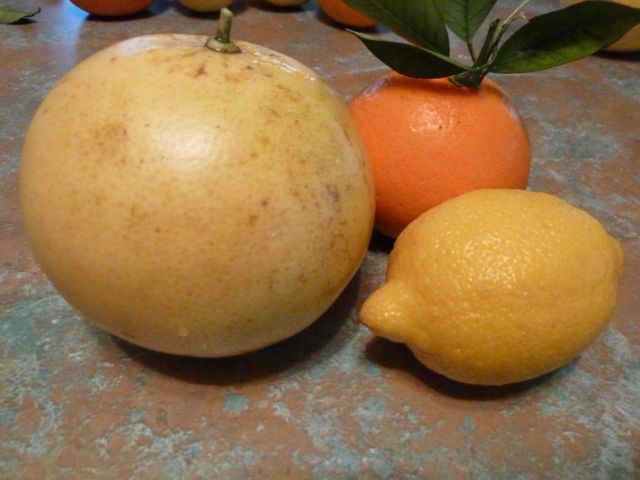 They are pink grapefruit. We don't so much eat grapefruit, unfortunately. Unfortunate because this tree produces probably a couple hundred pounds of it a year. So whenever I see a recipe for something that might include grapefruit, I at least consider making it. So getting the grapefruit required for this dish was easy. 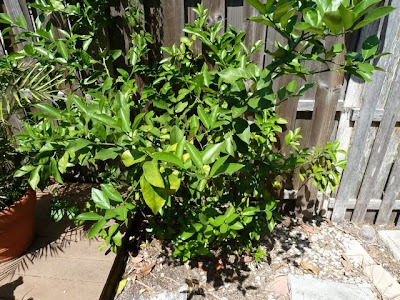 Here is a picture of a lemon tree. I have been trying to grow Meyer lemon trees since we moved to Clearwater 11 years ago. I always have one or two going. Usually they die without ever giving any fruit. In 11 years, I have gotten two usable fruits from a collective four or five trees. This tree is doing well, and is growing. So I'm hopeful. But it doesn't have any fruit on it. It was in bloom a couple weeks ago, and the backyard smelled great while it was. But now the blooms are all spent, and I don't see where any fruit has set. Grrrrr. So I got the lemons for this dish at the farmers market. 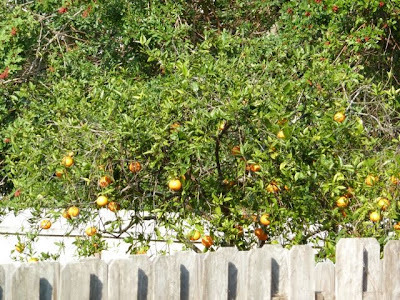 Here is a photo of an orange tree. Note the fence between me and it. That's because it is in my neighbor's backyard. So to get the oranges for this dish, I waited for the dark of night, scaled the fence, picked the oranges and ran back to my house. Not really. Actually, I picked a half-dozen grapefruit, walked next door, knocked and offered to trade the grapefruit for a couple oranges. They don't eat grapefruit either, but told me to go ahead back and take whatever I needed. It was such an easy transaction that I wished my neighbor had a bearing lemon tree. Enough with the citrus. Here is a photo of a red snapper. 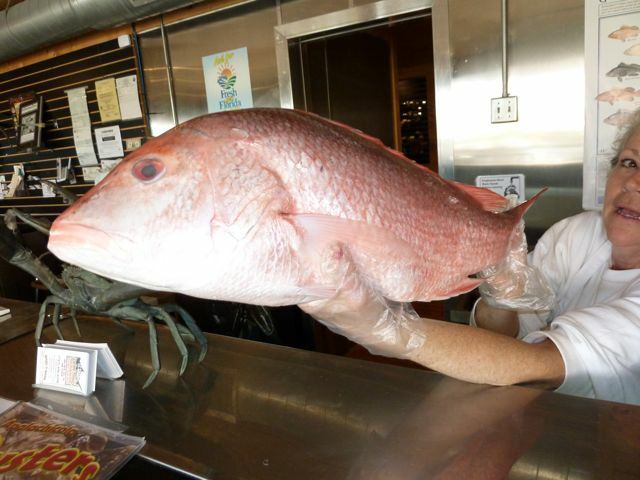 This red snapper was in the counter at IC Sharks, which has become my go-to fish place. I tried to go to a couple of the well-known, established places around here, and each time was stunned by the smell when I walked in. They smell like fish. A good fish store shouldn't. When I walked into IC Sharks, it smelled like there was fish smoking in the back. That is a completely acceptable smell. 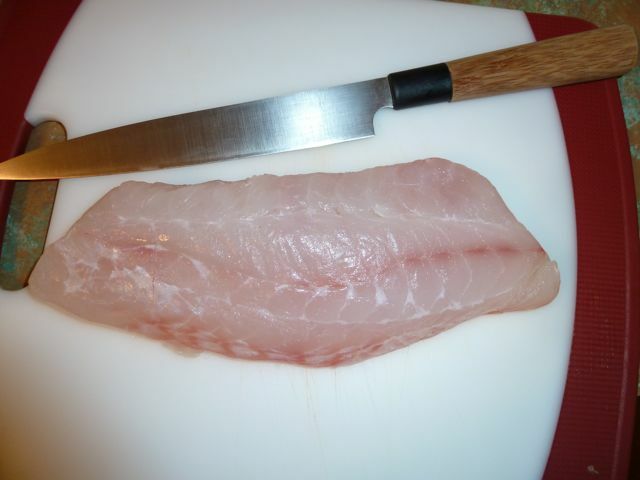 So this isn't the fish I bought, because they already had filets cut in the case. I told the woman behind the counter that I needed a really, really fresh piece of fish because I was going to be serving it raw. She looked at me like I had just said that her kid was ugly. And, like, her favorite kid. "It was on the boat a couple of hours ago," she said. I took a whiff. It smelled like nothing. Exactly as it should. She took the skin off the filet for me, and I went home. Maybe next time I'll go fishing. The rest of the produce came from the farmers market. Putting this dish together was embarrassingly easy. A red pepper jus was just a matter of blending some peppers and straining. A jalapeno salsa requires a couple of seconds in the food processor. The citrus has to be segmented and juiced. The fish was diced in two minutes. The asparagus was on the grill for a few minutes to get a char. Loved this dish. The key is the fish (as much as I tried to make it about the citrus). I got a great piece of fish, and it was totally worth it. It was like Italian sashimi. The recipe in the book is for a standard jowl, which would be about 2 pounds. 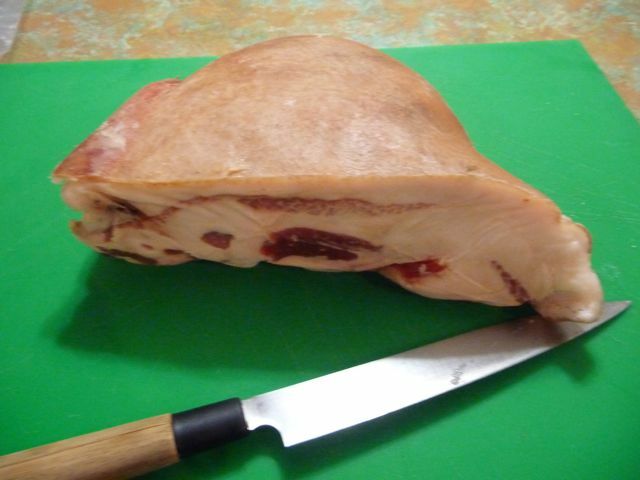 I have been angling for awhile to get my hands on some Mangalitsa jowl. I could tell you all about what a Mangalitsa is, but I would be re-writing the information from the Heath Putnam Farms website, so I'll just link to them if you want to know why they are special. Him: Jim, I have some Mangalitsa jowl that I can send you at a good price. Me: Ok, I'll take whatever the minimum order is. When can I give you payment info? Before I got a reply to that, I came home to find a huge box on my doorstep. I had no idea what it even might be until I saw the return address. The box was far too big for what I had ordered, or so I thought. I opened the box and saw a piece of meat that I didn't even understand. I thought it was a belly. A whole belly. Me: I didn't order a belly. I looked closer. It wasn't shaped like a belly. There was a label. 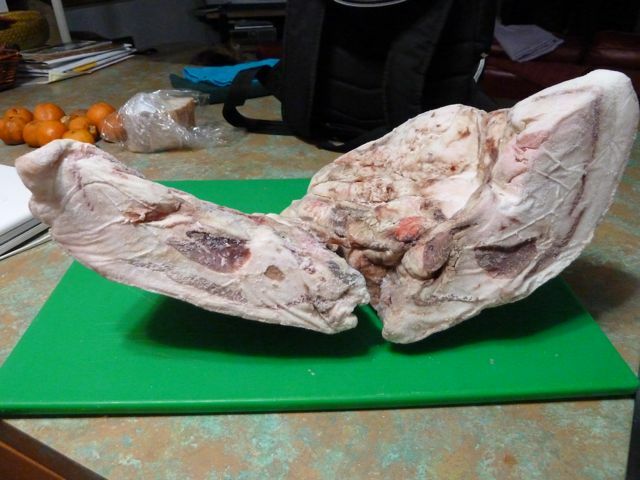 It said it was a hog jowl. And it said its weight. Keep in mind, one pound is a reasonable weight, and two is normal. Three is not crazy. This one went to 11. And a half. 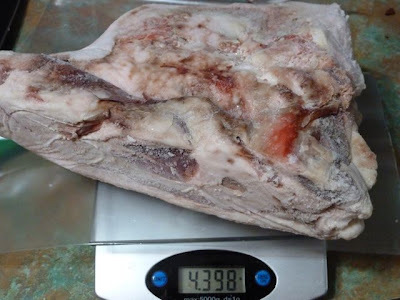 I'm not familiar enough with the anatomy of a pig to know how that happens, and I told Dave that I was confused and assume that the pig this came from must have weighed 1,000 pounds. Him: It was 280 pounds hanging weight. They are all jowl. Marching orders accepted. After I asked a follow-up question regarding adjusting the recipe, I have started the process. The first thing I did was separate the lobes and for now I'm only curing the smaller one. Still, that smaller lobe is almost 4.5 pounds. 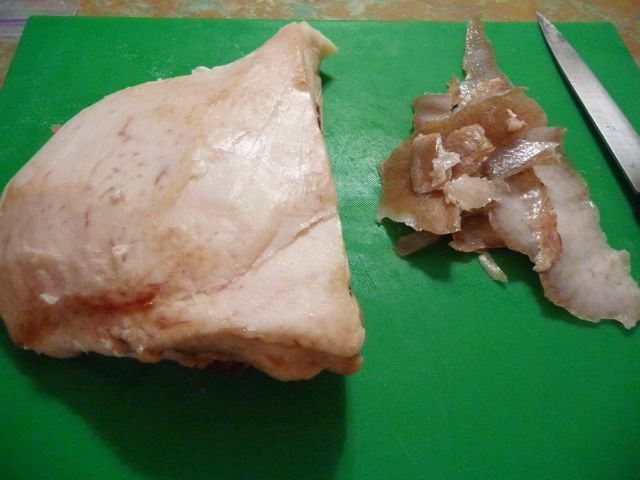 Then I trimmed off the skin. Then I mixed salt, sugar (I usually only keep brown sugars in the house, and this is demerara) and pink salt. 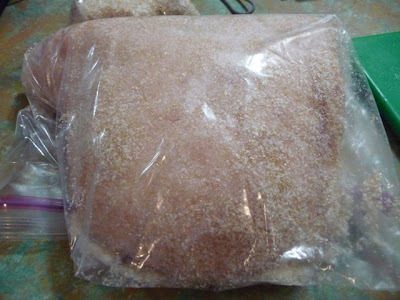 Then I put the jowl in a bag with some of the salt mix, and now that bag resides in the bottom of my fridge for a week. At that point, it will get a good rinse, then hang to dry for several weeks. 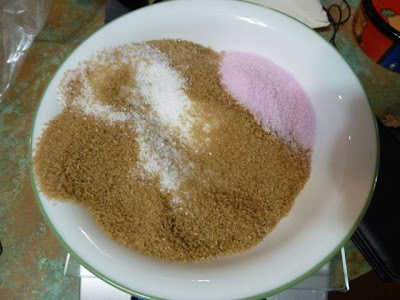 This is a short post, because there wasn't any drama in the acquisition of ingredients. 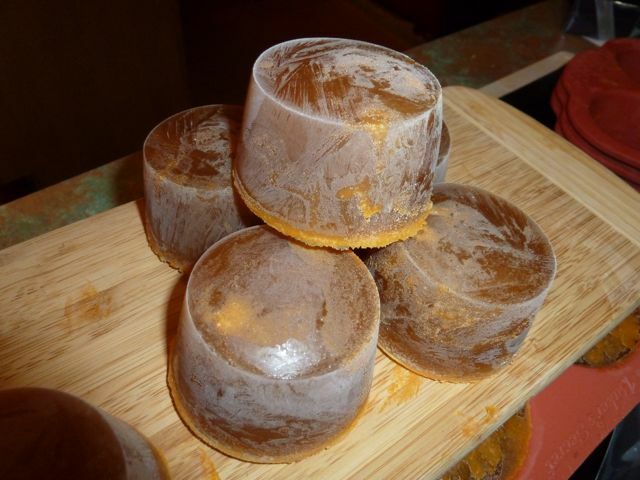 I made preserved lemons. A couple of cuts, some salt and some juice. the recipe says to put in a jar, but I tried that and it was going to take too much salt to cover everything, so I put them in a zip bag. I put them in the bottom of the fridge, and in a month, I plan to look like a genius. 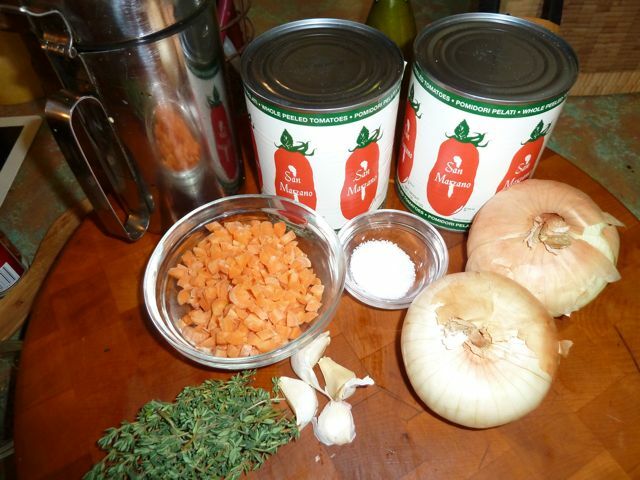 I made the basic tomato sauce. I looked at the recipe for this, and was like, well, yeah, tomato sauce. Yawn. It isn't a lot of ingredients, and I was expecting really basic tomato sauce. But when it was done, it was really good. Like, stunningly. I suspect it was partly because I started with San Marzano tomatoes, and partly because it reduced a good bit, but I can't wait to use that stuff. I made brown chicken stock. Actually, there was a little acquisition drama here. I asked the guy at Whole Foods if they had any chicken backs, because I didn't want to buy too much chicken to basically boil away. He said they did, and they were 69 cents a pound. The drama: I FOUND SOMETHING IN THE WHOLE FOODS MEAT DEPARTMENT THAT COST LESS THAN $1 PER POUND!!!!!!!!!! It felt like magic. 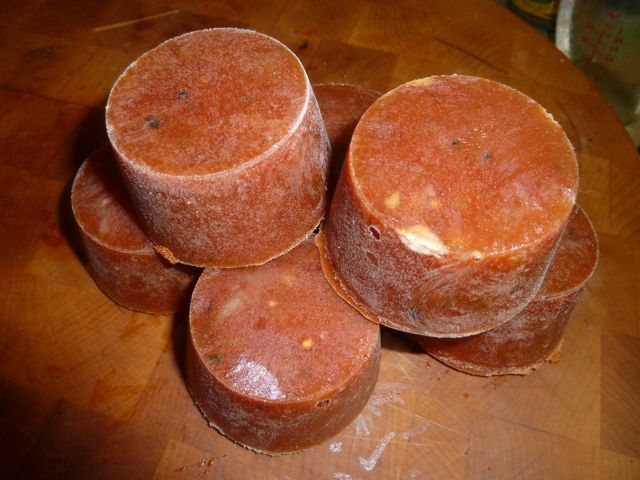 I used the backs and some drumsticks, as well as the herbs and aromatics. Then when it was done, I picked the meat off the bones and made chicken salad with it. It felt like it was free at that point. And it was good chicken salad. Oh, and when it came time to freeze the stock and the tomato sauce, I learned something: The silicone cupcake pans that I bought way too many of a couple of years ago hold exactly one-half cup. So now I have them perfectly portioned in the freezer. And I am keeping December open so I can go collect my Nobel prize. This photo represents the most ridiculous extreme ever in the world of mise en place. In fact, I'm not even going to say what it is. But if all goes well, this will be a featured ingredient in a couple of dishes coming up from the Babbo cookbook. I have five things growing right now, and plan to grow at least three more things for in the fall. 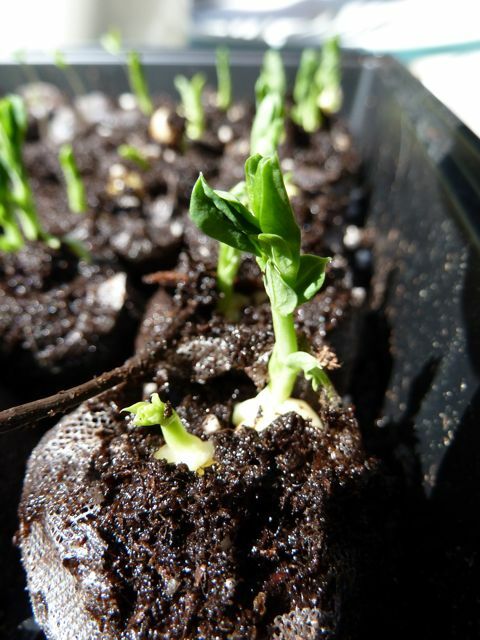 I haven't had much luck in growing things in the past, so I'm keeping my optimism in check. But according to the seed packet, we might be able to have them by mid April. 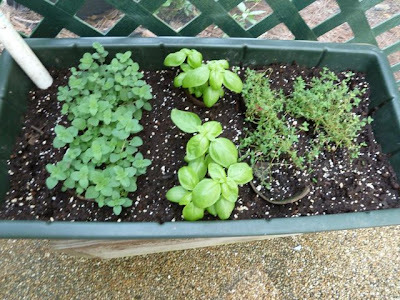 I also have a planter of herbs going. 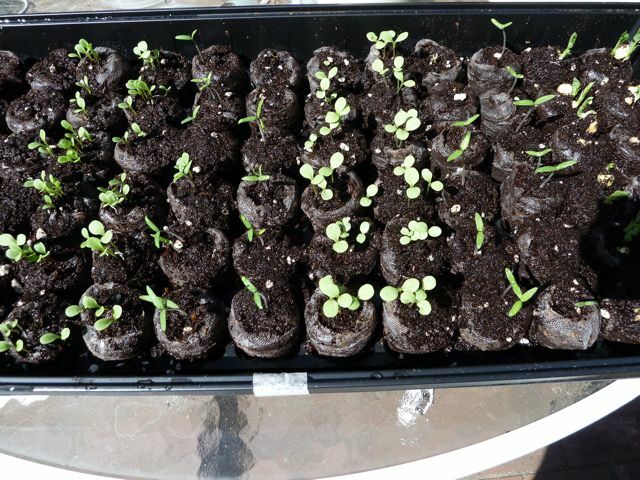 I have thyme on the right and oregano on the left. Those I bought as plants from Home Depot because I figured I needed them as soon as possible. 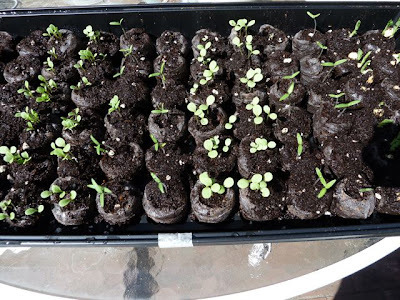 Thyme and oregano seemed to be the herbs called for most in the book, so I figured growing my own made more sense than constantly buying it. There's also basil in there, just because I like basil. Caveat: The oregano is Greek and the thyme was German. If there are Italian-specific versions of those things, my Home Depot didn't have them. Oh, well. There is also some rosemary called for in the book. But we have one of those in the front yard that I hit all the time. 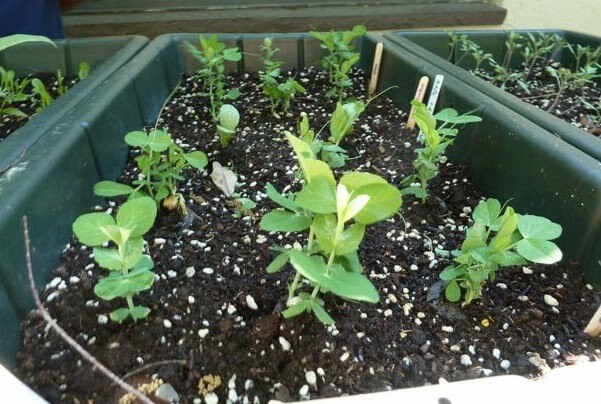 We'll check in with the progress of the plants every now and then. Now I just have to figure out how to keep the raccoons away. We'll check in on the plants again along the way including if they totally fail. And admit it, that would be more fun. Eventually I'll even tell you what they all are. There are a lot of things in this book that I don't know where I'm going to get. Which, ultimately, will be part of the fun. But it was really cool that with the first two dishes I made, I got to check two of the ingredients that concerned me off. I have seen cardoons before, but only once or twice. I saw them at the Fresh Market once, and I felt like it was in the fall of whatever year I saw them. So I was initially penciling this and two other cardoon dishes in for later in the year. But I heard that Tommy's produce stand in Clearwater often had them. So I gave them a call, and sure enough, they did. So much for a challenge. I knew that they basically looked like an out of control celery plant, possibly with a bad attitude. When I got there, I felt like they weren't spectacular specimens of cardoon. But then I had to admit to myself, I had no idea what they should look like. So maybe these were great. They were light green, with a few brown spots. But not too bad. By then, again, I was invested, so I got them and came home. I peeled them and trimmed them, then cut them into what amounted to a rough julienne, and boiled them for 45 minutes. The cooked cardoons -- which is fun to say -- go into a casserole in alternating layers with heavy cream and parmigiano-reggiano cheese, then into the oven for 20 minutes. While all that is happening, there is a little artichoke-radicchio salad to go with the gratinato. And sort of like the fennel in the last post, artichokes are something I always love when I have them at a restaurant, but I've never cared to try to deal with them myself, other than out of a can. They just seemed like so much work. So, this recipe doesn't call for artichokes from a can. (In fact, off the top of my head, I think the only thing in the book that calls for something out of a can is a vinaigrette that calls for canned truffles. And I just saw what a can of those costs. Yikes.) Here, I took baby artichokes and trimmed and quartered them, then put them in a skillet and covered with oil that is infused with mint and red pepper flakes (above). Here's how hard this dish is: You bring the oil to a boil, then turn off the burner and walk away. The artichokes cook in the cooling oil. To spectacular effect. Like the fennel, I will do this again. And again. And again. I see that these artichokes are involved in a number of dishes in the book. This makes me happy. So the gratinato comes out of the oven, and is plated with a little artichoke tossed with some shredded radicchio. Mine didn't come out quite as cohesively as it appeared to in the photo in the book. It is quickly apparent why the cardoons are paired with the artichoke. They are definitely similar in flavor. The cardoon was soft and nutty. Pam said it was a little bitter, but I didn't get that. The cheese also has a nuttiness, and it all worked. Well, I don't love radicchio, so that part wasn't great. But there wasn't much of it. So, so far, we are two recipes in, and I have learned to gut a fish, roasted a whole fish, figured out how to make fennel that I like, and ditto with artichokes. If I get nothing else out of this project, I feel good about that. "Do you have anything that's the equivalent of branzino?" I thought it was a reasonable question. I was at the farmers market in Sarasota, and the fresh fish vendor had a list of available species behind him. With fish, often times the same fish can be called different things in different parts of the world, so I figured it was worth a shot. "That's the same thing as swai," the guy tells me. "It's a trash fish they farm in Asia. We don't carry anything like that." I know he is wrong, but I smile, say thanks, and walk away. He is right about swai being a trash fish they farm in Asia. Well, it's a catfish, anyway. Maybe "trash" is a little pejorative. But branzino is a small sea bass, mostly from the Mediterranean. I didn't know if maybe there was an equivalent elsewhere, but I was pretty sure it wasn't a catfish. At this point, the branzino dish was just on the list of dishes I might make, because I had to figure out what I could get first. So I went into Whole Foods, which is right next to the farmers market, and saw that they had bronzini. Logic and Wikipedia told me that that was the same as branzino. But they only had one. sigh. I needed at least two. So I called the Tampa Whole Foods, which had two, and I went there to pick them up. When I got there, they were already bagged and waiting for me. I was a little wary of this, because it's fish, and I want to see it before I buy it. But I figured, what am I going to do at this point? Not buy it? I was committed to the dish, and I've never had anything but good luck with fish at this Whole Foods. So I asked the clerk if the fish was cleaned, he said yes, and I bought the rest of the ingredients. I got home, and apparently "cleaned" meant something entirely different to the Whole Foods guy than it did to me. See, I was expecting no guts. This was a bad expectation. Apparently, cleaned just means descaled. I wanted "cleaned and gutted." Now I know. What this all means, is that I got to learn how to gut a fish. Turns out, there is nothing to it. One big pass with the knife, then just be OK with sliding your fingers through a bunch of slimy bits, and it's all over. From there, it was easy. I washed my hands. Three times. Sliced up the fennel, olives and herbs, and put them in the cavity of the fish, where all the guts had just been. I made the lemon jam that goes along with it, but I think all my ratios were off, because I was using some really big Meyer lemons, and the skin was sort of bitter. I'm looking forward to trying to make the jam again. It didn't come out great. What did come out great was the braised fennel. I love fennel in restaurants, but whenever i make it at home, not so much. But this was really easy. Just braise in white wine, then saute with some sugar. It was fantastic. The fish was good. Not my favorite fish dish ever, but decent. Not sure I got great fish, because the meat was a little soft. Or maybe that's just how branzino is. It was fine. We finished the fish.